Two new courses have been developed in the last few years based on highly successful learning methods used in other countries, and these are available in Edinburgh. These methods bypass most of the writing and grammatical rule learning that can often get in the way of fluency. Although the main aim is to get you communicating in Gaelic, the courses also stress the use of correct and natural Gaelic. It is quite possible to be talking confidently after a few weeks of intensive study, or in less than a year of once-a-week classes. The full course in each case is designed to be taught in a few hundred hours. The method behind Ùlpan has long been used to teach Welsh. In Wales (where the course is called Wlpan) many people need to acquire fluency in Welsh very rapidly for their jobs. The course gets students speaking for a high proportion of each class from the outset. It uses a carefully graded system of short phrases with simple repetition and gradual absorption to teach the language, rather than using mentally taxing grammatical exercises. The learning is reinforced with varied communication-driven exercises, dialogues and frequent review. A twice weekly class for complete beginners covering Units 1-12 from May 2009 on Tuesdays and Thursdays at 11 am at Tollcross. A weekly class on Tuesday mornings, Units 1-24, 9.15 at Tollcross. For complete beginners, starting in September 2009. A weekly class on Friday mornings, Units 19-24, 9.15 at Tollcross. Currently full, continues in September 2009 from Unit 25. A weekly class on Monday evenings, from Unit 25, 7.15 - 9.15 at Stepping Stones. A weekly class on Thursday evenings, Units 26-30, 7.15 - 9.15 at Tollcross. A weekly class on Wednesday evenings, Units 44-48, 7.15 - 9.15 at Tollcross. A weekly class on Tuesday evenings, from Unit 61, 7.15 - 9.15 at Stepping Stones. A weekly Friday afternoon classes at Tollcross. This class is beyond the beginner stage, and requires previous learning. In addition, intensive courses often run during the holidays. These can be a great way to achieve substantial progress in a short burst. Send us an e-mail at learn@Gaelic-Edinburgh.net if you would like to receive news of these. More information about Ùlpan can be found on the Clì websire. Clì, the national Gaelic learners’ association, will take over organisation and administration of the courses in due course. Note that Ùlpan courses may in some cases be eligible for ILA funding, which could help make a course affordable. Get in touch for more info. Contact us through learn@Gaelic-Edinburgh.net to receive alerts whenever new courses are scheduled. Gàidhlig 'san Dachaigh teaches using a method without any reading or writing at all, and involves going through the actions and interactions involved in common everyday tasks. Repetition builds fluency and confidence, and this is reinforced by physically doing the tasks while using the language. It is a method that has been used successfully in Hawaii and New Zeland. Courses are currently running in Edinburgh. 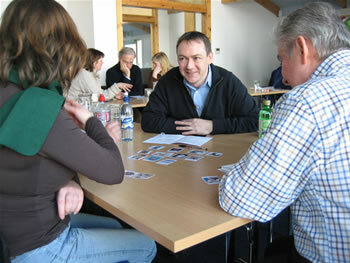 Contact learn@Gaelic-Edinburgh.net to find to alerted about any future course that may be scheduled.